Looking for a healthy alternative to curb my sweet cravings, I turned to parfaits. Parfaits are basically created by layering ingredients. There is usually a cream involved wether it be yogurt, ice-cream or whipping cream. There can also be fruits or jello. Nuts, seeds, and granola are sometimes added. There are even savoury versions that exist. Having actually forgotten they existed, I was reminded of them when I attended a friend’s bridal shower. They were served in cute, mini plastic martini glasses and I thought to myself, “Yup! I could eat more of this”. It so happens that pears were on sale and since I love me a good pear, I bought some to make what would become a very rustic (but healthy) type of compote to add to my parfait. 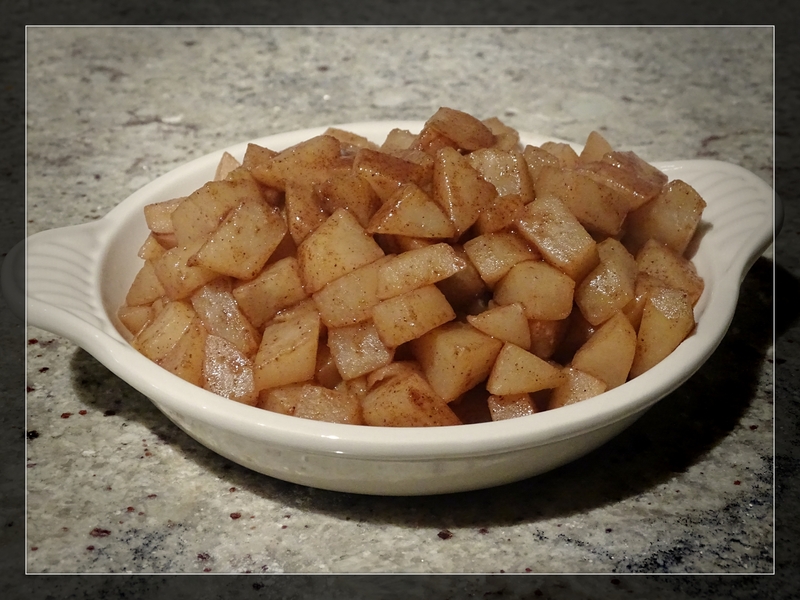 What makes this recipe a healthy option is that it has no added sugar and the pears are cooked and softened in their own, natural juices and sugars with the addition of a bit of water. I used 4 pears which made more than enough for 2 parfaits but I was able to use the pear compote for many other things too. It went well with oatmeal, over ice-cream and even on its own. 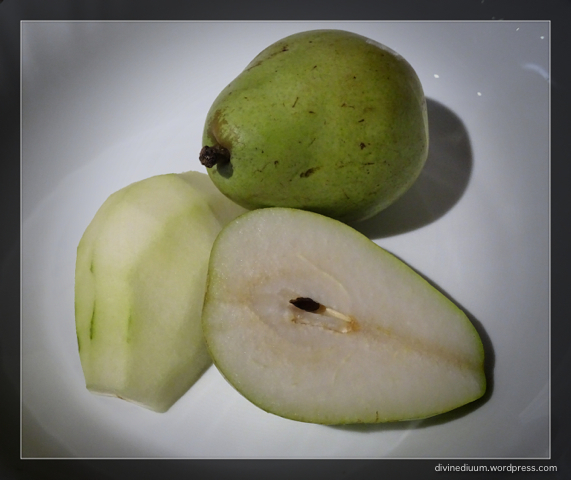 Because the process is fairly quick, cut up the pears into smallish pieces so they cook quicker. 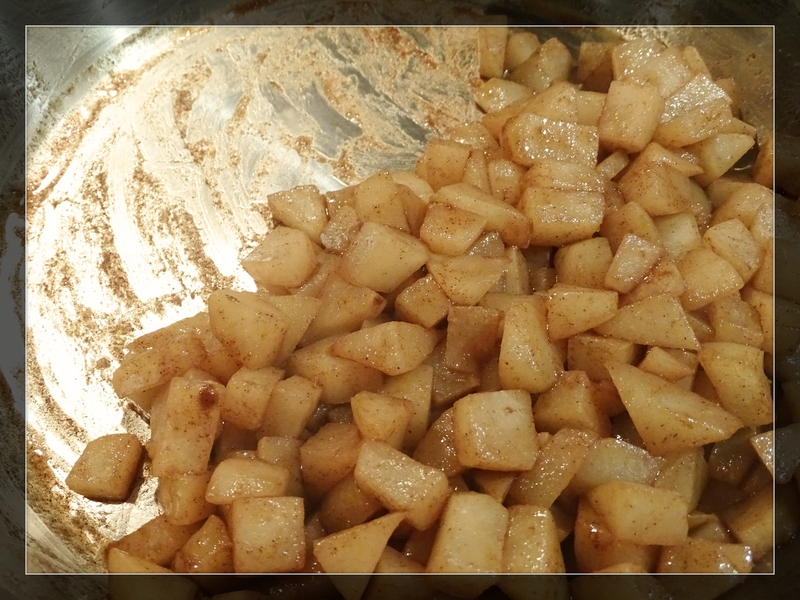 In a pan, toss in the pears with 1 Tbsp of vanilla, 1 tsp of ground cinnamon and 1 C of water. Bring this to a boil and then reduce heat and simmer for approximately 15 minutes. The water will evaporate and by the time it does, the pears will soften. The sugars will release and create a natural syrup. It you prefer your pears softer, continue adding water and allowing it to evaporate until the pears are the texture you prefer. Assembling the parfait is the fun part. You can create any layers you wish. When I think Greek yogurt, I am reminded of time I spent in Greece. Every morning the hotel would serve a “standard” Greek breakfast. This included a thick, Greek yogurt drizzled with the most amazing honey and the option of nuts. 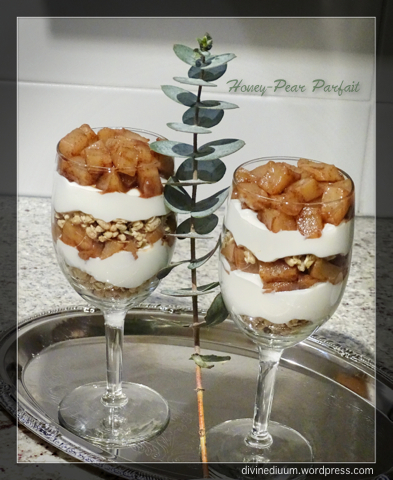 Honey yogurt and pear compote seemed like a winning combination. Rather than nuts, I opted for granola because I discovered that stores carry so many flavour varieties which means, in the future, this recipe could become something new by simple changing the flavour of the granola. To keep with my Greek inspiration, I opted for an almond granola but this is where you can play around with tastes, including the fruit you use and the type of yogurt as well. 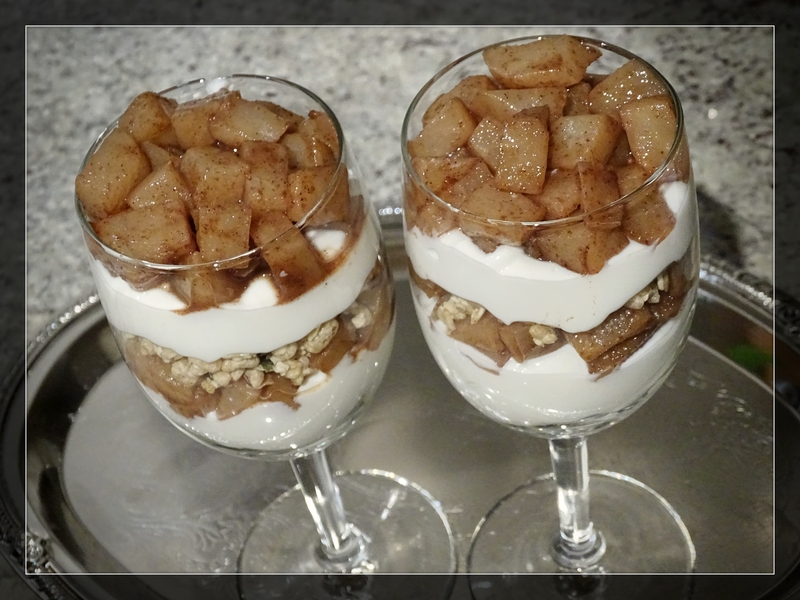 In total, you will need approximately 1/2 C yogurt, 1/4 C of granola and 1/2 C of pear compote per serving glass. You can present it in different sized and shaped glasses and may need to adjust the portions accordingly. I used a standard wine glass. Layer the ingredients: granola, yogurt, pear compote. You now have a healthy dessert option that won’t ever get boring. 1. 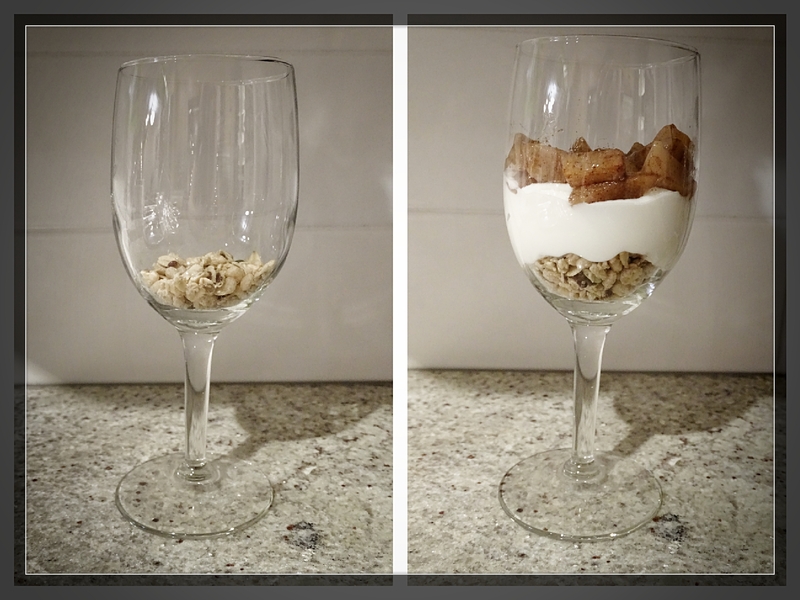 Layer ingredients in 2 glass by alternating granola, yogurt, pears. 2. For visual effect there should be at least 2 alternating layers of each ingredient.